Ezekiel 37 gave rise to this bit of fun, done here by the Cathedral Quartet. O Lord, by the merits and prayers of you son, Jesus Christ, keep me today from all evil and unruly desires, from all sins and temptations of the devil, from a sudden and unprovided death, and from the pains of hell. Enlighten my heart with the grace of your Holy Spirit. Grant that I may ever be obedient to your commandments. Let me never be separated from you, O God, who lives and reigns forever, Father, Son and Holy Spirit. ~ M. R. DeHaan, M.D. To each is given the manifestation of the Spirit for the common good. For to one is given through the Spirit the utterance of wisdom, and to another the utterance of knowledge according to the same Spirit, to another faith by the same Spirit, to another gifts of healing by the one Spirit, to another the working of miracles, to another prophecy, to another the ability to distinguish between spirits, to another various kinds of tongues, to another the interpretation of tongues. Some people treat the Holy Spirit like an unattractive relative. They know he exists and must be invited to family events, but they try to ignore him, our of embarrassment, as much as possible. Primarily this occurs when people with quiet, more dignified personalities associate the Spirit with loud, florid outbursts of speaking in tongues or falling on the floor, the practices of some Pentecostalist congregations. But Paul solves this (and other) puzzles for us, in today�s Scriptural passage. We do not, and we are not intended to, experience or even appreciate all manifestations of the Spirit. They come from the same God, but they are different in every person. Some people find the Spirit sitting alone in a quiet room; some in a quiet church service; some in their workplace, in a classroom, in nature; some in a raucous revival. We must know that this is the same Spirit, and even if we do not relate to the expression of faith, understand and sympathize with others who are not like us; for it is the One God who is present, the same Holy Spirit who we know in our way. The gifts we are given with which we may serve God are also different, as different as the people in which they occur. This is easy to see in the ministry. We have all known a priest or minister who was wonderful at dealing with the sick and bereaved, but whose attempts to give a sermon are agonizing. There are revivalists who can inspire us to heights of faith, and yet, they are helpless to explain theology. Some Christians can work at a charity for the poor, dealing directly with downtrodden people, but cannot lead a Sunday School class. We must use the gifts we have, not bemoan the ones we do not, or feel envy or even defensiveness or repulsion, at those with other gifts. God�s view is the one that counts, and it may be quite different from outs. He may value the janitor sweeping the floor of a homeless shelter with dedication and love, practically unnoticed by everyone else, while a bishop sitting in his chair may have a troubled spirit. We must do the best we can with what we are given, and God will judge us by our hearts and spirit, not by our earthly status. 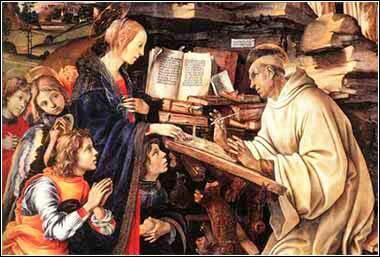 Saint Bernard of Clairvaux (artist unknown). St. Bernard was known for his great expression of Christian love.